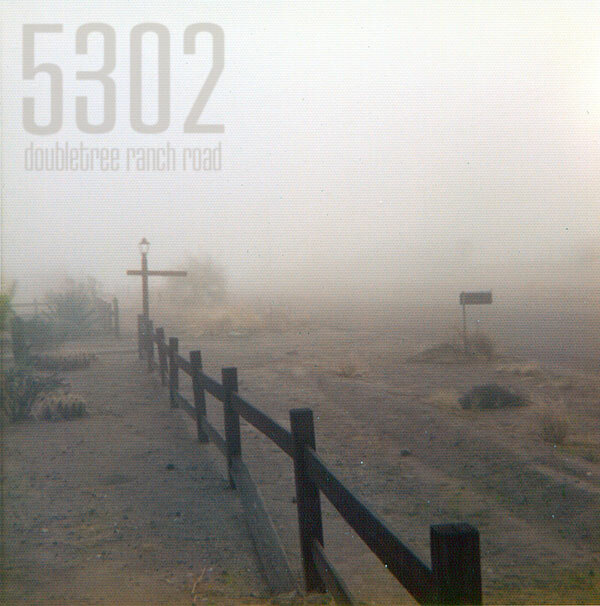 In May, 1966, my husband Paul Boucek and I purchased the home at 5302 East Doubletree Ranch Road in Paradise Valley for $29,500 when our son Andy was five months old. Our daughter Laurie was born the following year. 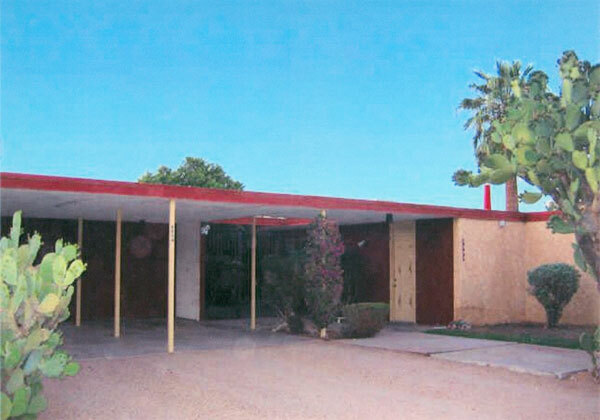 We were told by the previous owners that the home had been built in 1955 and that the architect was Al Beadle. 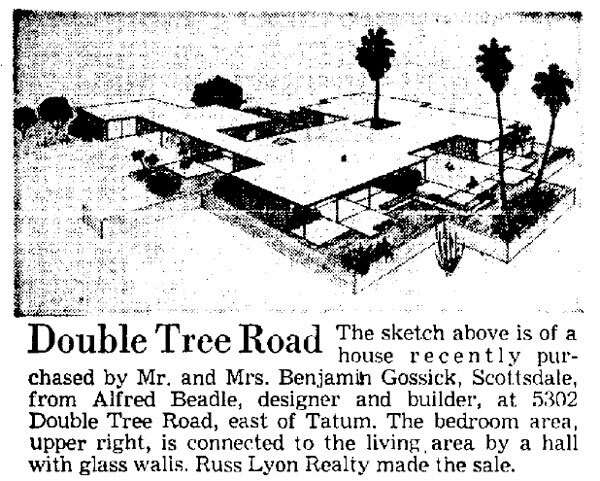 The original 1955 sketch for the home, as announced in the Arizona Republic. It was originally designed for the Beadle family, but they barely had a chance to live in it before it sold to the Gossicks. 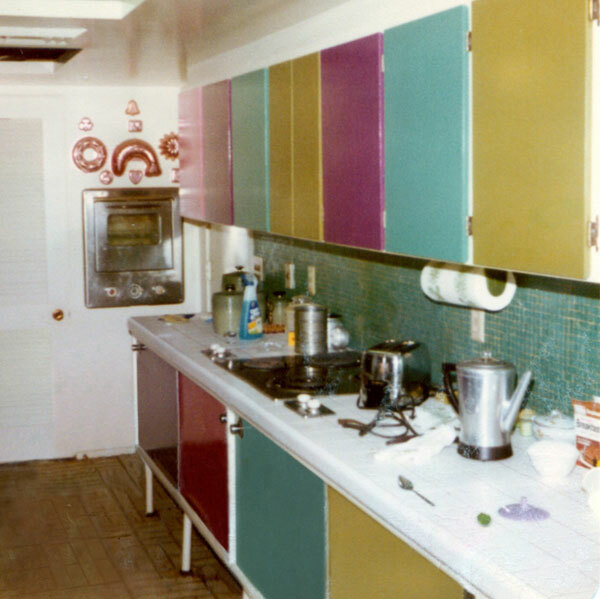 The kitchen cabinets were originally painted avocado, turquoise (to match the tiles of the backsplash and peninsula), orange and yellow. I changed the orange and yellow to my favorite pink and purple, and we replaced the old asbestos tile with white brick vinyl. The refrigerator and freezer were enormous stainless steel boxes next to the pantry. Except for manual defrosting they were very convenient. All appliances and the sink were stainless steel. In the 1970s the refrigerator and freezer had to be replaced by an avocado side by side, which left room for a built-in cabinet and microwave. 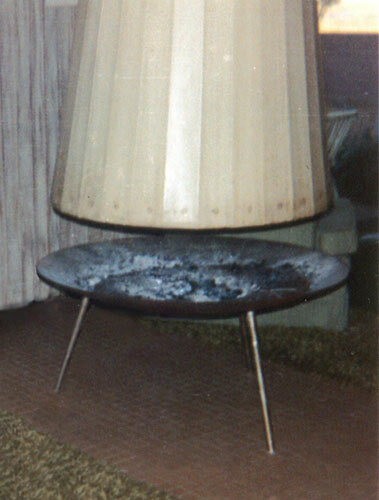 The circular fireplace between the living and dining areas hung from the ceiling in the same spirit as Beadle's White Gates home and the Safari Hotel and Resort in Scottdale. The carpeting was a dirty brown by that time and was replaced as soon as possible with blue/green shag in the living and dining areas and gold shag in the master bedroom. 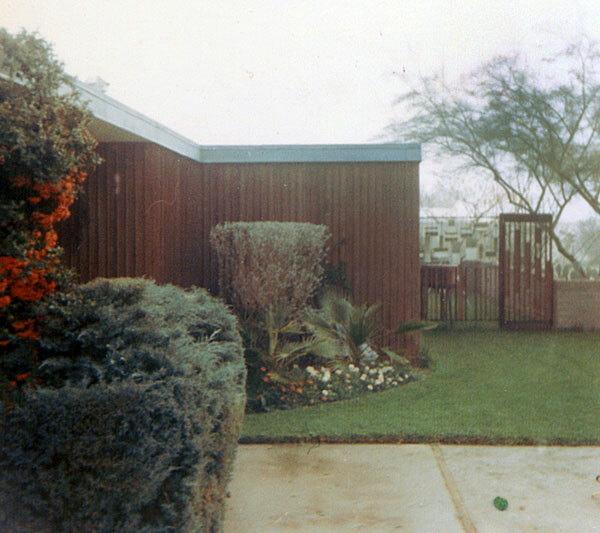 The grey louvered doors throughout were repainted avocado, including the louvered wall between the family room and master bedroom, and the family room was painted beige. There were skylights in both bathrooms and a turquoise-tiled (the same tile as the kitchen) vanity and sink in the master bedroom (where there was a third skylight), with a door closing off the toilet and shower. Between this and the bedroom was a built-in cabinet with two-sided doors with two shelves at the top and four drawers on each side. There was a large cabinet with two shelves next to the vanity mirror beneath which were recessed shelves accessible from the closet (also with louvered doors) to the right. There was another closet with louvered doors to the left of the cabinet in the master bedroom, and another just to the right of the vanity. This had a recessed storage area underneath a large doored cabinet to the right of the vanity. 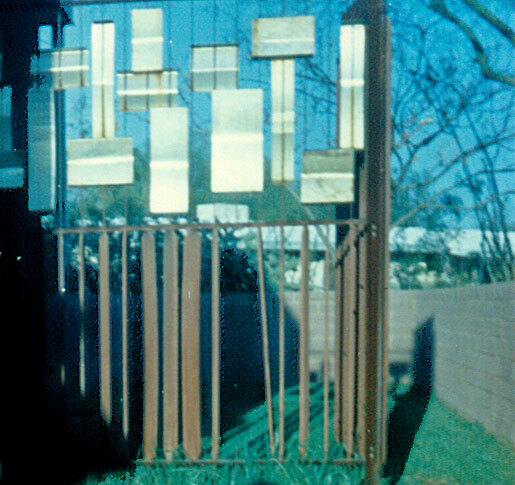 A glass door/wall opened onto the back yard. This was covered with gold blackout drapes because it faced the east. There was a stone wall at the right side with two built-in wall sconces matching the three in the living room and the chandelier over the dining table. 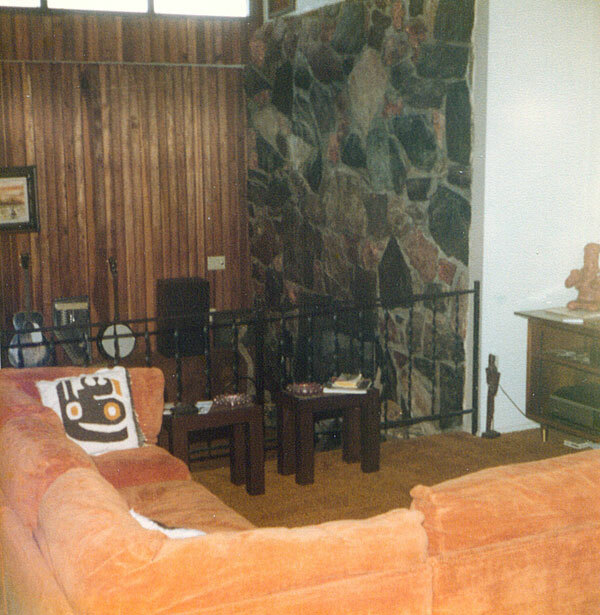 All of the bedrooms opened onto the family room, which had an Arcadia door opening to the entryway/atrium. The children's rooms had high windows near the ceiling and each had a closet. The only remarkable features were in Andy's room, which had grass matting on one wall and a built-in shelf in a recess, to be used as a desk. The family room was floored in brown asbestos tile which was not replaced. The washer was in the children's bath off the family room and the dryer in a closet behind louvered doors at the opposite end of the family room from the master bedroom. 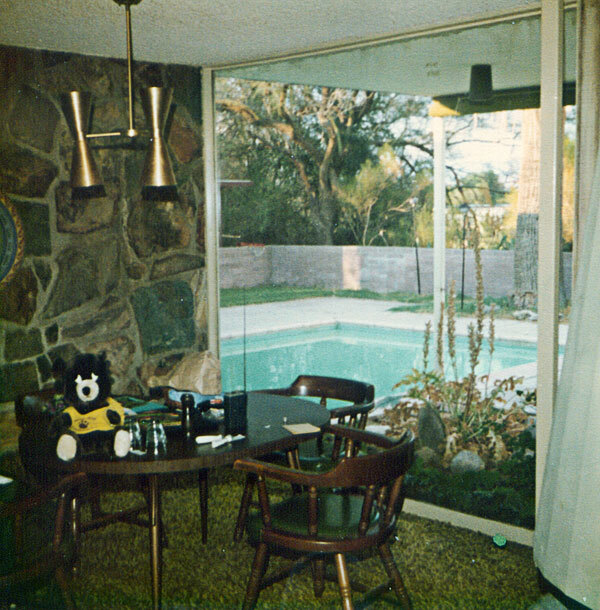 In 1974 we planned an addition to the home consisting of an additional bedroom and bath, a pool room (to get the pool table we had received as a gift several years earlier out of the living room!) and sunken conversation pit. A large stone fireplace incorporated rocks from a copper mine in which we owned a share, and there was to be a vaulted ceiling above with clerestory windows echoing the high windows in the children's rooms. I telephoned Al Beadle's office in the hope that he would design it, but was told he was far too busy. We then hired the husband of a friend of mine, William I. Kaake, to serve as general contractor and the three of us worked out the design and features. We all got very tired of hearing "they don't make that anymore" when trying to match floor tile, etc. to the original house as we wished to do! Bill proved to be an excellent, honest and hard-working contractor and we were very pleased with the job he did, with only one notable exception. 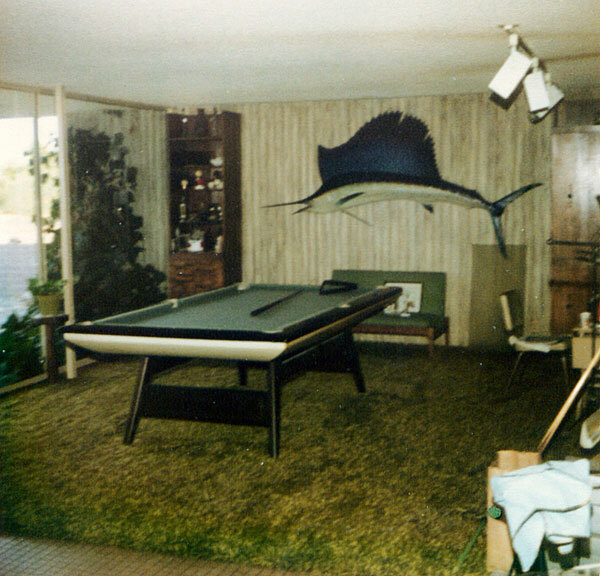 Although the pool table fit perfectly in the allotted space, Bill (not being a pool player) didn't leave enough room on all sides for pool cues in play without running into a wall from time to time! He was more than chagrined, but I was very pleased when the space instead became a beautiful living area! The built-in, cork-lined recess for hanging pool cues became ideal for hanging photos. The addition cost approximately $18,500. Facing the house from Doubletree, the office was a separate room about 12' square with an Arcadia door and a built-in wall air conditioner. It was used as an office for Paul's Chartered Life Underwriter studies and served as quarters for a housekeeper in the early 1970s. It was a wonderful place to raise children; pretty much crime free and except for the occasional rattlesnake and scorpion, the access to the desert was great for them. The new elementary school two blocks away was quite convenient, especially after the installation of the bike path we mothers worked tirelessly to bring about. Had my nights been as happy as my days, I would be there yet. The home has since been stuccoed over on the façade, which in itself would have been grounds for divorce!